My Land Rover recently began experiencing a new problem. Luckily, some googling found it to be a known issue and I found many tips for solving it. The symptoms I had were: the alarm would sound randomly (when it was set). Also, sometimes the dash text display would indicate that the hood was open "BONNET OPEN". Apparently this is because the hood sensor goes bad. It's connected to the passenger side hood latch at the front of the truck. I can buy a replacement sensor for about $12, and pay another $10 for shipping. I found forum posts indicating that it takes about 30 seconds to swap it out. Unfortunately, I'm not the most mechanically inclined, and I cannot figure out how to remove the sensor. Maybe I need to remove the latch. For that, I'd need to buy a new tool, since none of mine fit those holes in the mounting bolts. Instead, I decided to do what other forum posters had done, short the circuit at the connector. Below is a photo of that connector. I merely connected the two contacts with a wire, then taped it up with electrical tape. I figure I can easily undo that and install a replacement sensor, once I figure out how to do that. I also might take it to the dealer and have them fix it. But since I'm on my extended warranty, I prefer to collect a few items so that it exceeds the $100 deductible I'd have to pay. Here are some links, but they're likely to dry up given the obscure topic. LR Forum Threads: Thread1, Thread2, Thread3. The part number is LR002794. This part appears to be superceded by a new part number: YUE500150. 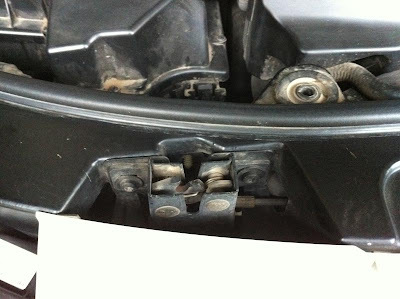 Here's that part for sale on an online parts outlet: hood sensor part. another site that sells the part. THANK YOU!!! I've been having the same problem for weeks now. I randomly came across your blog when I searched for a fix online and you were right! I was so convinced after reading your blog that I went outside just now (it's midnight here) in the dark, took a flashlight, folded up a piece of foil to be thick enough that I could connect to both receptors and plugged it back in and bam! No more "hood open" message and my lr3 now locks normally without honking the horn. Hopefully I won't be woke up at 4am by my alarm going off again!!! AGAIN, THANK YOU SIR! You are the bomb. Patrick: Glad to have helped. You'll see from my other post (on my other blog) that I eventually replaced the sensor. It was quite easy, once I figured out how to remove the old one. I ordered the bonnet hood sensor from Ebay and replaced it in 30 seconds! Super easy fix. Once you get the part, look on the passenger side hood catch. You'll see the wire as shown on the picture connecting to the backside of the sensor. Unplug the wire. The sensor connects under the hood latch and if you look carefully, you can see it below the hood latch. Look at the new sensor and you'll see where the two plastic clips will press in and then snap into place on the front of the sensor. 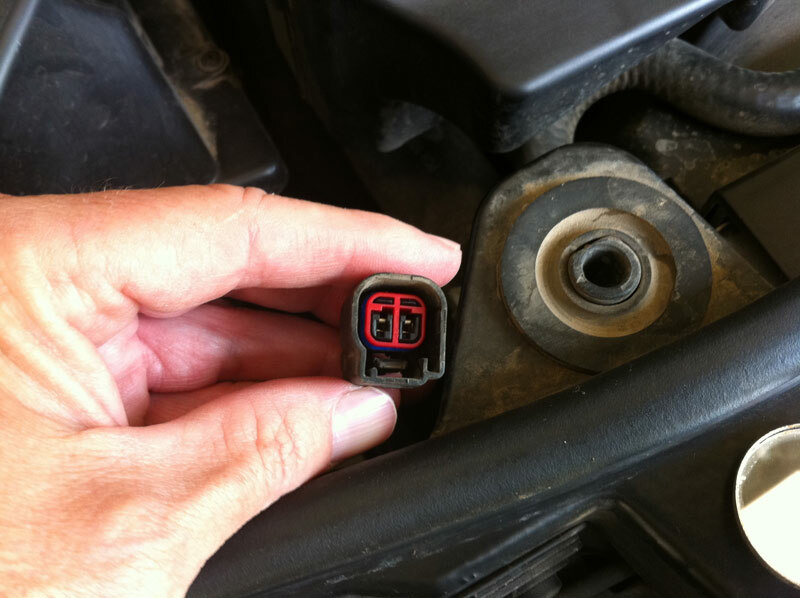 Push those tabs in on the old sensor and pull it down and off. Now push the new sensor back on and you'll hear it clip in. Now connect the wire and you're done. Thanks for the blog. All I did was to unplug it, place foil in the connectors to short circuit it and taped it. I will replace the sensor when I get one. Can anyone post photos? I am mechanically inept but would like to learn. My land rover dealer is charging me $164. Certainly, I'll post a new blog entry with photos. Hi Michael, thanks for your hel with this. I am having same issue, but I cannot find your blog to see how to replace the part. Can you let me know if you still have that blog post up somewhere? Thanks! I just unplugged mine, and left it unplugged. Haven't seen any side effects from leaving it off. I'm having the same issue and just googled where I found your response. Are there picture step by step of how to do this fix? I am mechanically inept as well so visuals help a lot, dealer wanted to charge me $250 for parts and labor. I'm out of warranty on my LR2, 08. I'm sorry I can't offer more photos, other than those I posted in the additional posts that are linked to at the bottom of this post. I no longer own a Land Rover. I have escaped the land of rovers.